Known as Red Fort or Lal Qila (in Hindi), the Red Fort of Delhi in India is one of the main tourist attractions of this country. This enormous complex that covers forty nine hectares was declared a World Heritage Site by UNESCO in 2007, hence the fact that every year it receives the visit of so many curious people, and also, its name is not coincidence, because as soon as you see the reddish color of the sandstone you’ll know why it’s called like that. History asserts that the red fort of Delhi was a palace of Shah Jahan in its new capital Shahjahanabad (seventh Muslim city that now occupies Delhi). It is said that Shah Jahan took the capital from Agra to give more prestige to the kingdom and thus have the ideal place in which to carry out their construction projects, such as the Red Fort of Delhi that we see today. In 1638, the fort was built and it took ten years to complete. It is located in the extreme eastern part of Old Delhi and its name comes from the walls built by means of red sandstone along its four sides. The dimensions of the wall are 6.5 km long by a height ranging from 16 to 33 meters (in some areas). And although in its beginnings there are indications that affirm that the fort extended by the Yamuna river, with the step of the years it has been modified. In addition, the wall located in the northeast corner is next to an old fort (Salimgarh) that was built by Shah Sur in the year 1546 and used as a defense building. Throughout its history it has not had too many reforms, from there to keep perfectly the original structure. However, in the eighteenth century some sections were damaged. Specifically, in the year 1857, the British army destroyed part of the gardens and pavilions. However, it was in 1903 that a restoration program for the fort was launched. 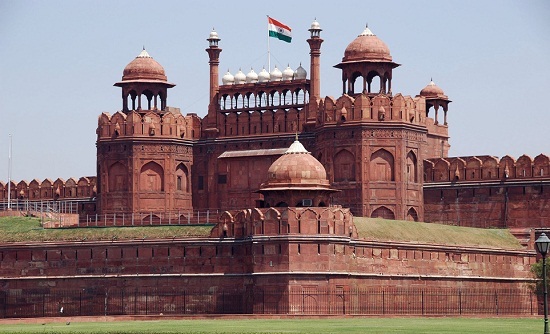 At present, we can say that the state of conservation of the Red Fort of Delhi is great, so it allows to enjoy and learn more about the culture, architecture and history of India through this site. The fort has two main doors: the door of Delhi and the one of Lahore, being this second the main entrance door and named for its orientation towards the city of Lahore. As soon as you enter the premises of the Red Fort of Delhi, the Chatta Chowk will appear before you , a bazaar covered with shops that attract tourists (and locals) to start loosing rupees. There are all kinds, souvenirs being those that take the cake. Further south, we find two pavilions that correspond to the dependencies of women: the Mumtaz Majal and the Rang Majal. While the Khas Majal is the third pavilion and in it the imperial apartments are located. In addition to the other pavilions, Diwan-i-Khas and the one containing the hammam. Nor can we overlook the Moti Masjid or ‘pearl mosque’. It was built in 1959 for Auranzeb, successor of Shah Jahan, as a private petty. It is made of white marble. And to finish, mention ‘the garden of the concession of life’, which is known under the name of Hayat Bakhsh Bagh and which was built in the year 1842. Once you have completed the tour, after visiting everything carefully, having rested in the gardens or sunbathing, it is time to turn around and leave the site, where you will come across a beautiful picture: the Digambara Jain Temple. There are many transportation options available to get to the fort. If you are nearby, you can go by subway to Chawri Bazaar station and then take a cycle-rickshaw to reach the building. Although you can also get there on foot (it’s about 30 minutes of travel). The entrance fee is 500 INR with a supplement of 25 INR for entering with a camera. Sound and Light Show held in the evening which describes the history of Mughal Emperors.